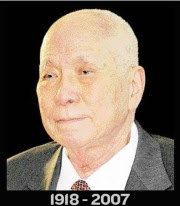 Sad to get to know the news about the death of Genting Group founder, Tan Sri Dato' Seri Lim Goh Tong at the age of 90. I respect him very much because he came to Malaya at the age of 19 with only 2 Dollars in his pocket!!! Read HERE from The Star online newspaper.